Matte gold plate decorative elements with a single glass bead hanging accent create a lovely necklace designed by Shlomit Ofir. Israeli jewelry designer Shlomit Ofir's work will appeal to lovers of gold jewelry and modern handmade Israeli jewelry. 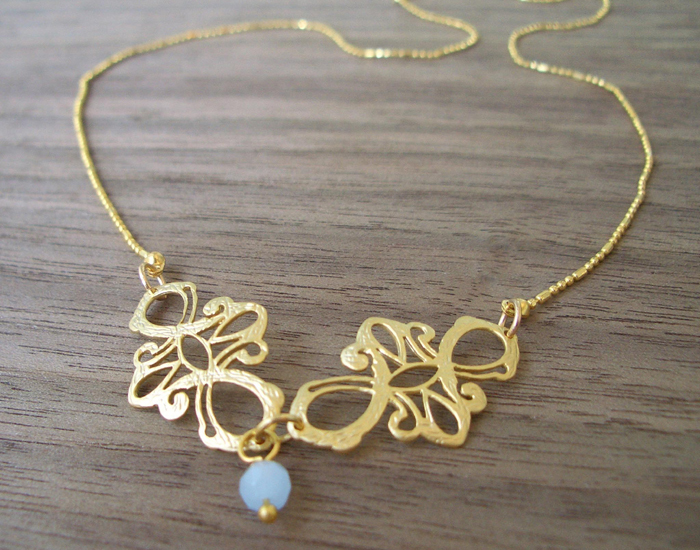 Ofir's Emma necklace is a lovely, delicate vintage-style piece. Two delicately carved elements in gold plate bring to mind the floral designs of a piece of tapestry or embroidery. The two gold plate pieces meet at the base of the necklace and are joined by a round link. The warm tone of the gold is set off by a single multifaceted ice-blue bead of Czech glass. The narrow gold-plated chain is worked in an old-fashioned style, giving the necklace the feel of a piece of heirloom jewelry. The length of the necklace is 17 inch (44 cm). Shlomit Ofir's designs are modern but have a timeless air and make wonderful additions to any jewelry collection. Her pieces are also perfect gifts for any lover of handcrafted jewelry in gold and silver plate and for anyone who appreciates Israeli designer jewelry.